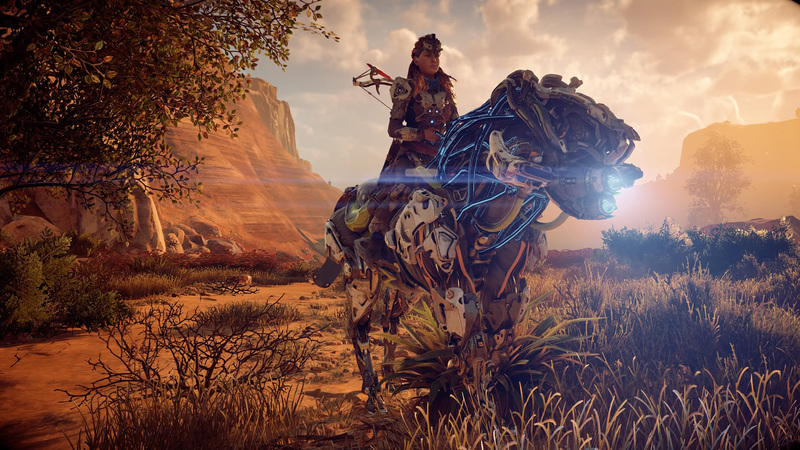 Horizon Zero Dawn is Playstation’s latest “Hollywood Blockbuster”. The hype on this game is HUGE, with pretty much every single games reviewer out there (both big and small) giving it a near perfect rating. I watched a fair few trailers a while back, didn’t do anything for me stylistically (even though I love robots! 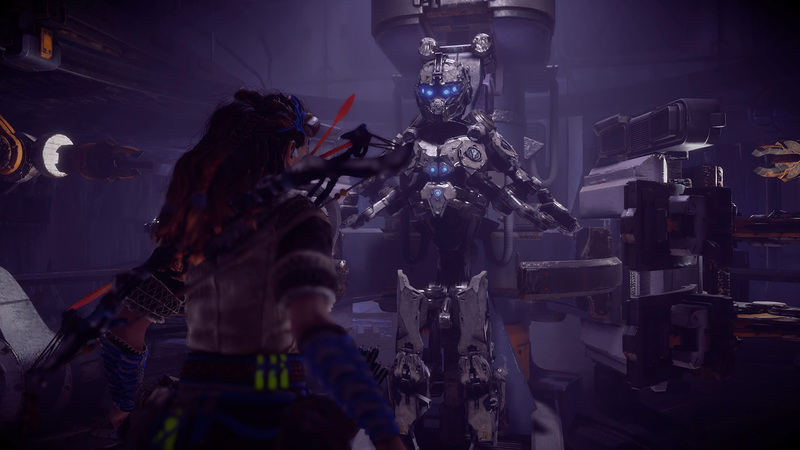 ), and the gameplay footage of the main character Aloy climbing up a huge giraffe like robot (in reality it’s one of the more fun things to do in the game) just put me off as that kind of dynamic story telling puzzle solving Lara Croft stuff just isn’t my thing. The game came out last week. I tried to hold it at bay for a few days as Ved and I have been playing Ghost Recon Wildlands, but the hype train got me so I pulled the trigger. Entering a Cauldron. Cauldrons are very much like Skyrim’s massive underground caves. Lara Croft moments actually got more and more enjoyable. I’ve just finished the game over the weekend. I stuck to the main quests and have kept the side quests for end game play. The game is super slick, and smooth as, but felt more like an interactive movie than a true open world action RPG. 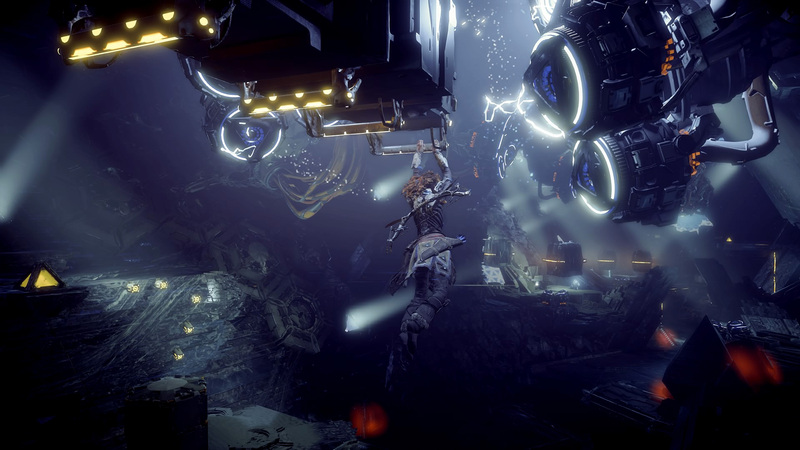 Much of the praise has been on graphics, open world, gameplay and story. I never felt like I was truly in an open world, in fact I always felt like I was on a track (unlike Fallout 4’s huge open map, or Skyrim, or Ghost Recon Wildlands). And regarding RPG, it’s light, very light. I didn’t do much RNG at all and still finished the game just fine with low end gear. Regarding the action; killing various robots was pretty fun, but shooting arrows isn’t so fun. I love shooters, but with an arrow you’ve got to press the trigger to draw it back, then let go of the trigger to let the arrow go, which makes fast shooting of big robots feel really really silly (as you’re shooting every time you let go of the trigger) so I’ve ended up setting my character up to be much more of a melee warrior (it’s nice that you can). One skill lets you call a ride whenever you like. Riding beasts lets you travel large distances fairly quickly. It’s a lot like riding horses in Skyrim (you can even set your ride to auto pilot), great mechanics and I found myself riding around quite a lot. You get to make choices in the game, but they don’t seem to have any consequences. 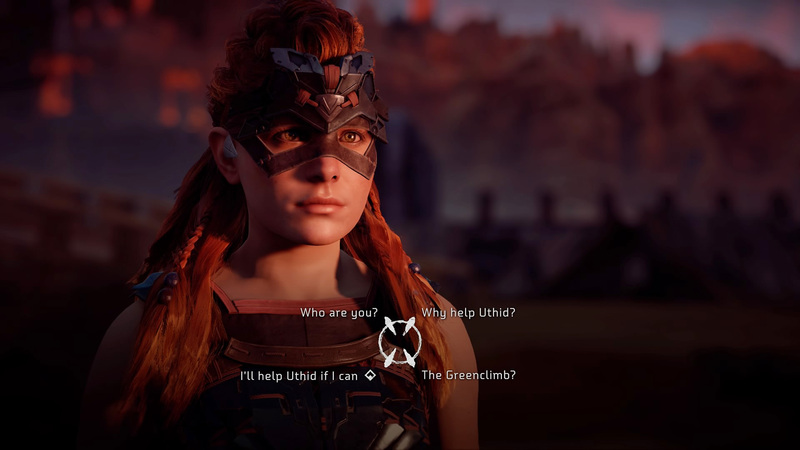 I assume because it’s a much smaller game in reality than say Fallout 4 (where choices completely change the outcome of the game), but at least the choices you make let you play Aloy how you like (which is strangely satisfying). 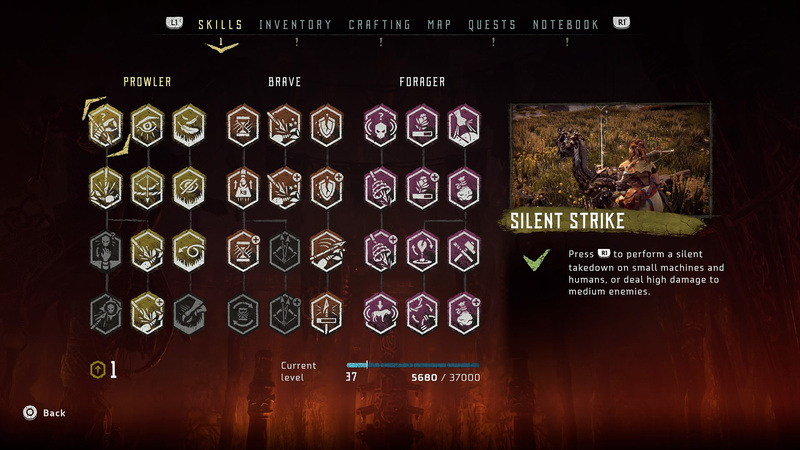 The skill tree is super easy to max out (in comparison to Fallout 4 or Skyrim where some players still have yet to max out their skill trees years into the game). I went for all the convenience skills to begin with as usual and it played out nice. 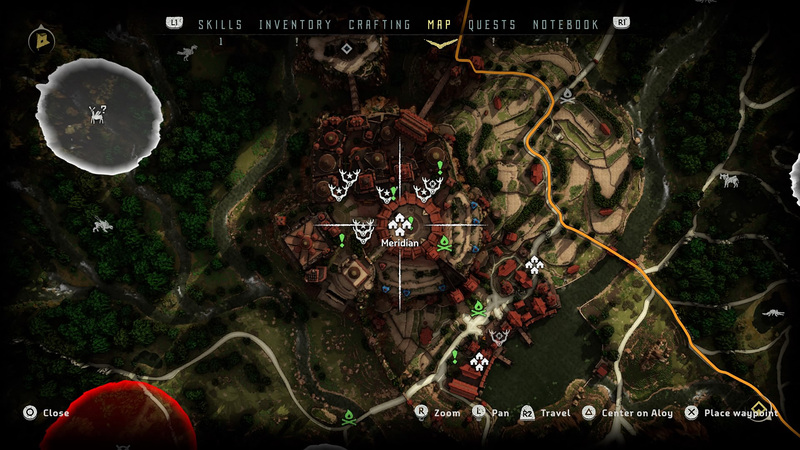 Loved using the map (hate using crap maps in good games!). Fast travelling costs you, which is pretty cool, and end game you can buy yourself an unlimited fast travel pack (very clever as this further encourages you to discover the rest of the world). Yup, had to do whatever it took to get the secret shield-weaver armour! I used the photo mode to capture all these shots too (nice feature with on the fly camera panning, depth of field adjustments and more). All in all I enjoyed the game (and I’m still enjoying some end game activities like clearing out cauldrons, which are set in huge Skyrim like caves) and story (especially loved the ending scene). Lots of reviewers out there are comparing Horizon to Far Cry, but I feel it’s more like an easy/commercial version of Fallout 4 (especially with the secret suit above, it’s setting is pretty much exactly the same as the overpowered X-01 Quantum Power Armour in the Nuka World DLC and it’s hard to get… but NOWHERE near as hard to get as the X-01 QPA! ), except I didn’t get anywhere near as emotionally involved as Fallout (Fallout 4 really really got me, especially the soundtrack). Graphically it’s just a huge let down as I’ve been playing games on the PC in ultra. Horizon is just full of super low res textures on the PS4 (yes the graphics are meant to be better on the PS4 Pro) and I just can’t get over that fact, but the cut scenes (typically where you talk to characters in the world) have got to be the best looking cut scenes I’ve ever seen in a game (many have complained about strange lip synching but I still think it’s some of the best), controls are great (crafting arrows on the fly mid battle actually ends up feeling 2nd nature), the detailed map, and using it (especially zoomed in) is great and the costume designs, and character designs in general were awesome (especially love how they use rope, string and leather materials to tie emblems in place). My PC really is the “console killer” in that I just can’t look at console graphics as being anything but bad, jaggy and low res now. I’d LOVE to see what Horizon looks like on my new Sony HDR 4K TV with a PS4 Pro, but I’m not ready to buy a Pro just yet. Having said all that, Horizon is one super polished game. If you’ve got a PS4 you’ve pretty much got to buy this game. 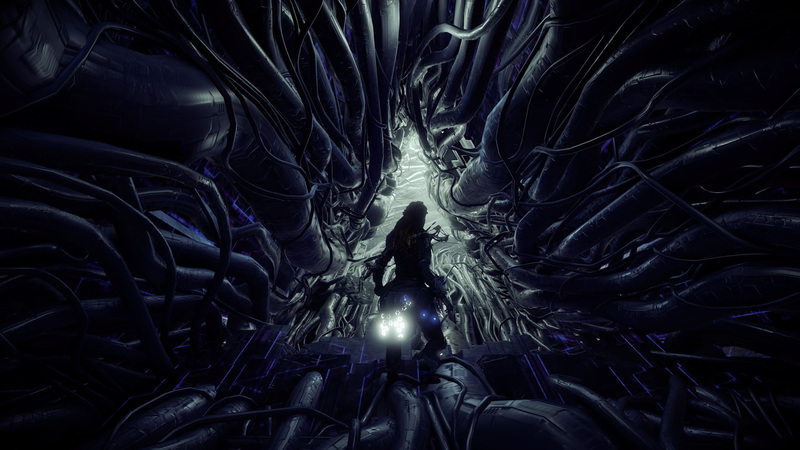 IE: If the PS4 only came with one game, this would be it!